In our last few Beyond Stock updates, we have been focussing on the Civic. In particular, we did a special look to establish reference figures for stock Civic SiRs, both automatic and manual. To continue this thread, I decided to look at stock DC Integras, i.e. the 1993-current generation. 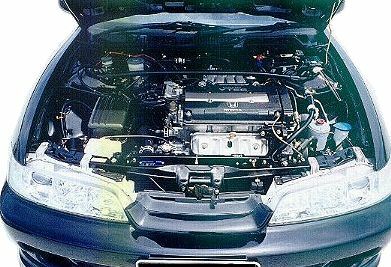 In this article, I will look at both the manual and the automatic Integra SiR (or Si-VTEC) together and will attempt to establish a reference power level for them. Introduced in April 1993 to replace the very successful DA-series Integra, the DC-generation Integra saw the significant introduction of the B18C engine. The 2-door coupe was coded DC2 while the 4-door sedan DB8. The larger displacement B18C generated an additional 10ps - 15ps but more importantly made use of VTEC and a variable volume intake manifold (dubbed VVIS) to give an extremely flat torque curve, giving not only high horsepower but very preppy midrange as well. The B18C displaces 1797cc, using the same bore as the B16A with an extended stroke. 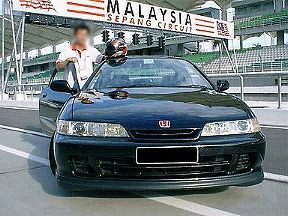 The DOHC VTEC valve train gave the manual version 180ps max power at 7600rpm with max torque of 17.8kgm at 6200rpm. Red-line is at 8000rpm. The automatic version generates a relatively high max power of 170ps at 7200rpm, only 10ps down from the manual. Max torque for the auto is the same 17.8kgm but at a lower 6000rpm. Redline for the auto is around 7600rpm. Having established to a very good approximation that total losses (transmission + accessories) for Hondas is 15% for manual and 30% for auto, we can thus derive the expected theoretical Dynojet figures. For manual DC2 or DB8 we will thus expect around 153ps while for automatic DC2 or DB8 we should be expecting around 119ps, both for results on a Dynojet. 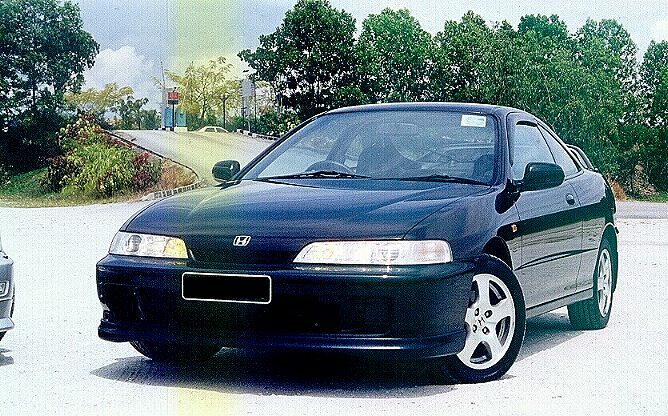 The owner of the DC2 in this article, Mike, upgraded from his VTEC-Civic in 1999. Enlisting the help of his friends, he was fortunate to have a number of DC2s and DB8s to choose from. In the end, the extremely good condition of a pearl black DC2 caught his heart and he decided to purchase it. His car forms the masthead for this article. After the obligatory round of extensive service, Mike decided to complement it with a package designed to ensure that the engine is in peak health. This package consists of cleaning the injectors (on a injector cleaning machine) plus a HKS AFR to make sure the engine's air-fuel mixture is optimized for the local atmospheric conditions. An added advantage to the AFR package is the dyno-tuning provided will also allow the base distributor timing to be optimized. As discussed above, the theoretical dynoed power for a manual DC2 is derived to be around 153ps at the wheels. The Dynojet chart reproduced on the right however shows the first base-run to be at 148ps. However, this is only the base-run, with work still to be done flowing the injectors as well as fine-tuning the air-fuel ratio using the HKS AFR. Without both of these, the air-fuel ratio is not optimum, so the 148ps delivered is actually below par for the engine. With the injectors cleaned and checked to be flowing at 100% efficiency, the re-dyno now delivered almost 151ps at the wheels, a 3ps gain. The injector cleaning process starts with an initial calibration check and the injectors were found to be flowing at quite a bit below the spec rate. Since PGM-Fi meters amount of fuel flow into the combustion chamber by regulating the injector opening duration, so the partially blocked injectors were causing a lean air-fuel ratio at the engine. Cleaning the injectors consists of immersing them into an ultrasound bath, using a special injector cleaning solution. Ultrasound works like many tiny hammers chiseling away at the blockages at the injector nozzle and the re-check done after the ultrasound cycle was completed showed that all the injectors now being balanced and flowing at 100% or very close to 100% efficiency. Usually, the fuel-filter will also be changed as well. Performing the injector cleaning package brings the engine's operating air-fuel ratio right back to near optimum, directly giving the 3ps power gain. 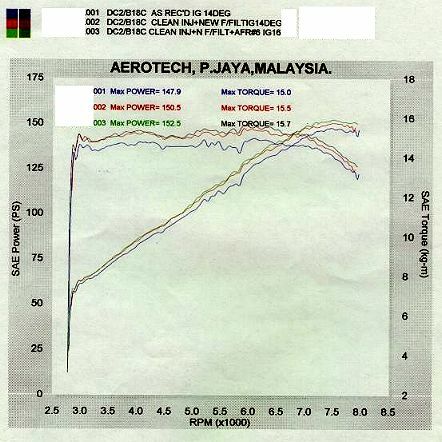 Clearly seen from the dyno chart is the consistent gain across the whole dyno rpm range, confirming the benefits of having the injectors cleaned. With the injectors now working at proper efficiency, the AFR is now installed and used to further calibrate the engine's air-fuel ratio to the local atmospheric conditions. As described in many previous articles, this consists of properly setting the AFR on the dyno as well as setting the base ignition timing via the distributor. This tuning showed gains mostly in the high-rpm range; gains started only around 5000rpm, a bit after VTEC has activated the wild-cams with significant gains obtained after 6000rpm, when VVIS opens the secondary intake runners. Final dynoed power was almost 153ps at the wheels, spot-on the theoretical calculated power based on 15% over the spec 180ps at the engine !! Based on this particular case, we should be confident therefore to set our reference value for stock manual B18Cs to be 153ps at the wheels on a Dynojet machine.